Several collages are in process in my studio. One was recently banished to the framing room, because I felt it wasn’t going in a positive direction. For a long time I couldn’t articulate why. Finally I experienced an epiphany: it is not always about color. A detail of a monoprint collage in process. I have been using more brightly colored base monoprints for recent collages. 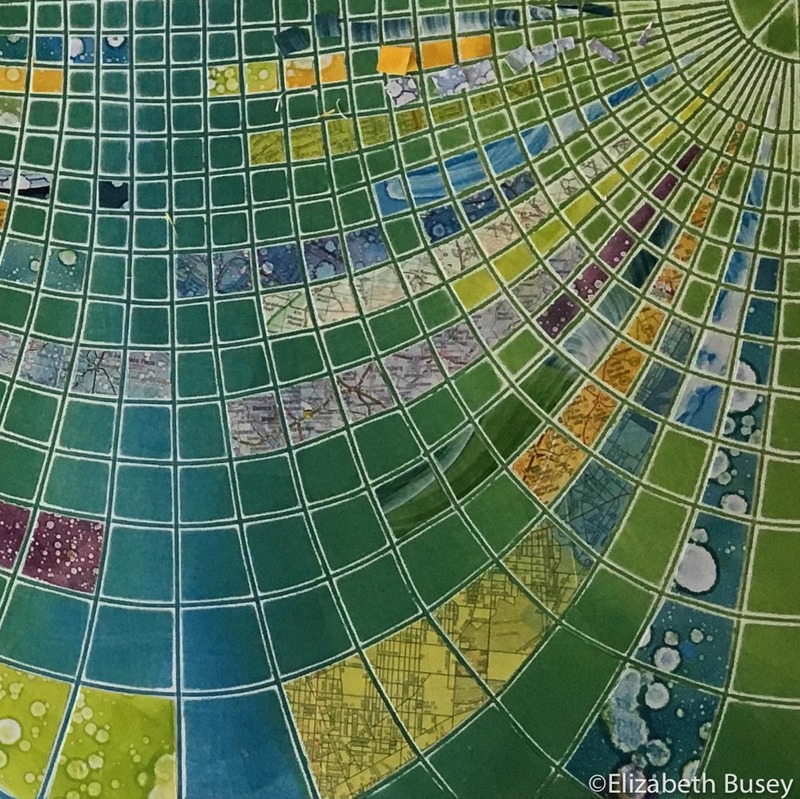 After working with some brightly colored maps and other monoprint patterns, I sat back to assess the progress. All I could think of was “Meh.” Clearly “meh” is not a feeling I want for a potential viewer, so I was doing something wrong. Were the colors not harmonizing? Were the maps and textures confusing? I finally put the collage away in frustration and began something new. But I can see the offending work every time I walk down the stairs to my family room. It looked pitiful, sitting there unfinished, unloved. Black and white view of the same collage. 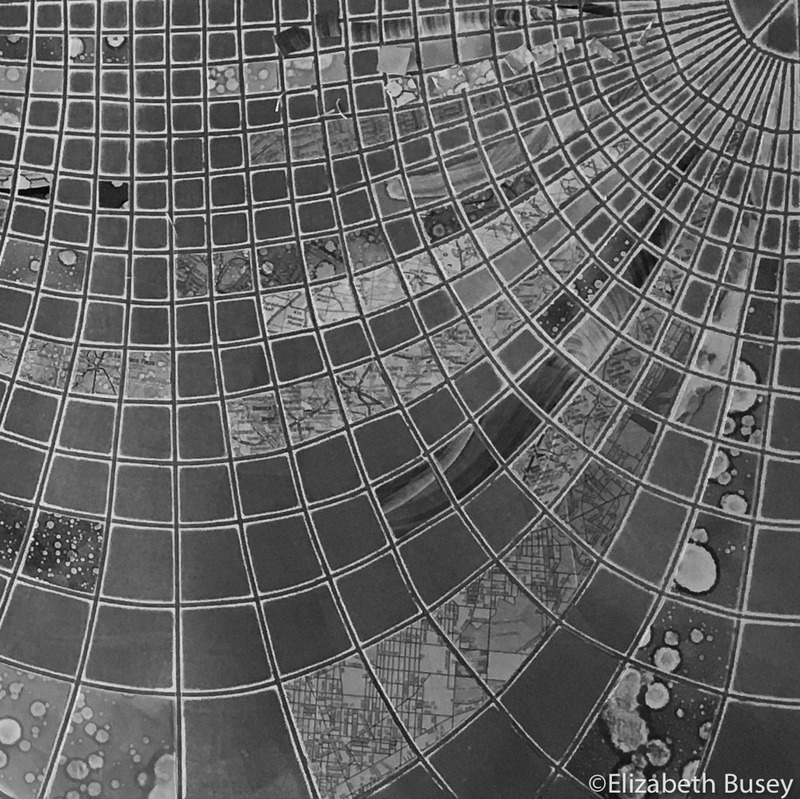 When I photographed part of the work, and put it into black and white, I could see a potential problem. Many of the tones are very similar, even though some are patterned and others plain. When you take the color away, things look very different. Areas of white Masa are still quite translucent. Now I had to think of solutions to my problem. I considered the monoprint patterns I have been using, printed on thin Masa paper. The paper itself is somewhat translucent, especially in areas that are left white or have very light ink printed. The oil-based ink also seems to add to its translucency. When glued over a darker monoprint base, these pieces lose their lightness. To combat this problem, I flipped over these patterned pages and painted a white acrylic wash over the areas that were printed on the other side. I used titanium white thinned with water that had wetting medium added. With a large foam brush I painted quickly and hung them to dry. Because I am using matte medium as my adhesive, I reasoned that these surfaces would bond together nicely. So far they have. 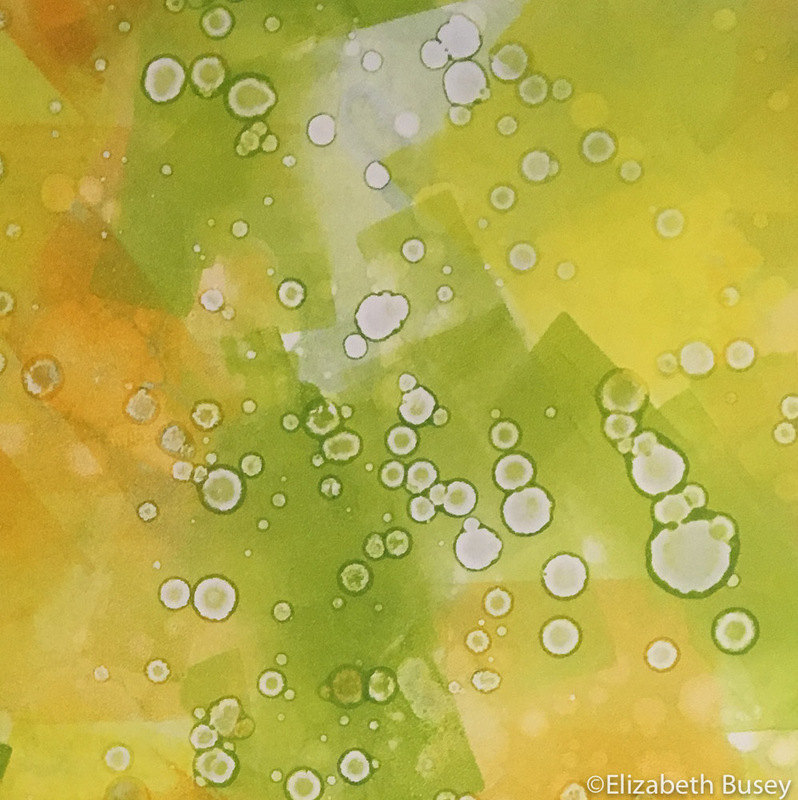 This entry was posted in Color Theory and tagged black and white, color, Masa, titanium white on April 5, 2019 by Elizabeth Busey.